Here’s a different one from the Jennie -O Turkey website it’s Porcupine Turkey Sliders! I left the link to the recipe at the bottom of the post. While there check out all the great Turkey Recipes and Ideas! In large skillet, add onions, celery, garlic and oil. Sauté 5 minutes or until tender. Set aside. In large mixing bowl combine turkey, cooked rice, cranberries, spinach leaves, egg and pepper, Worcestershire sauce, red pepper and cooked onion mixture. 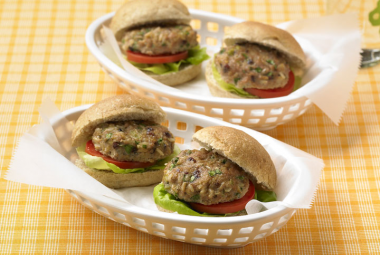 Divide turkey mixture into 12 equal portions and form patties ½-inch thick and 3-inch diameter. Place in large skillet on medium heat. Cover. Cook 15 minutes turning 2 to 3 times and until internal temperature reaches 165° F. as measured by a meat thermometer. Always cook to well-done. Serve on buns with lettuce leaves, tomato, red onion and slider patty.